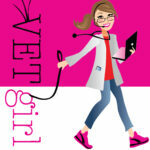 In today's VETgirl online veterinary continuing education blog, Amy Newfield, CVT, VTS (ECC) reviews triage. Triage is a French word and means “to sort.” It is one of the most important skills a veterinary technician can have. Failure to triage appropriately may mean life or death for the patient. The initial triage may occur over the phone. A telephone triage log of the calls should be kept. Because it is a legal document the log should be stored for several years depending on the state laws. Remember that the recommendations you offer to the client can have legal ramifications and it is important that you document the conversation to protect both yourself and the clinic. The safest thing to instruct any client to do is to come in, even if you don’t think it’s an emergency. The client knows their pet the best so if they are calling and are concerned, just have them come in! Any change in an animal’s breathing is an emergency. Owners often mistake labored breathing as “panting” or shallow breathing as “sniffing.” When performing a physical exam it is important to step back and simply look at how the patient is breathing. Your sight will be one of the most important tools at determining if the patient is having difficulty breathing or not. If there is any question on the degree of respiratory distress the patient should be given oxygen supplementation until treatment and diagnostics can begin. Mucous membrane color is also an important tool in determining respiratory function. Though not completely accurate (because lighting, anemia or icterus hides the appearance of cyanotic membranes) any presence of cyanosis issue which needs to be addressed immediately. A pulse oximetry machine measures the oxygen saturation of hemoglobin, which is a very insensitive measure of oxygenation. Normally animals should have a range from 98-100% on room air. The drawback to a pulse oximetry machine is that, at times, it is not very accurate. Patient movement, poor perfusion, hair, or any color other than pink mucous membranes (icterus, cyanosis, anemia) can cause the reading to be inaccurate. However, the pulse oximetry machine continues to be a fairly quick and easy test to use to determine overall oxygenation. Upon initial presentation the level of consciousness (LOC) should be assessed. An animal may be conscious, but have abnormal mentation such as slow or inappropriate response to stimuli. Any patient that has a declining LOC is an emergency and the overall prognosis of the patient worsens. Because a normal healthy animal is usually anxious at a veterinary clinic, any level of depression or any animal that is very quiet should be concerning and may indicate an emergency. The most common conditions that can cause a change in cardiovascular status are hypovolemia, anemia, sepsis or cardiac dysfunction. Mucous membrane color may be altered from a normal healthy pink to a muddy, grey or pale color. Any change in mm color is a life-threatening emergency. Capillary refill time should always be under 2 seconds. During cardiovascular collapse you may see an increase to 3 seconds or greater. Heart rate may be either increased or decreased. Pulse strength may be either bounding or weak. Both the heart rate and pulse rate may be irregular or nonsynchronous. One of the key indicators in the early stage of shock is an elevated heart rate. Some patients may have an elevated heart rate because of excitement, but the overall patient must be assessed. There are numerous potential heart arrhythmias and while some may be not life-threatening, until the patient receives a full cardiac workup all arrhythmias should be considered life threatening. If during the physical exam a heart arrhythmia is ausculated, the patient should have an electrocardiogram (ECG) performed. I like the RAP method because it’s that fast and easy! I often get asked what vital parameters do I consider an emergency. As a reference you are welcome to use one that I created. Most hospitals are comfortable with the below chart and many post the chart for their team to utilize so everyone in the hospital understands what is a true, life threatening emergency. Thank you for this description. Good points to remember. I especially find the levels of alertness helpful. Sometimes BAR vs. QAR just doesn’t explain it all. When you describe perfusion and O2 saturation being variable based on mm color, how accurate is a pulse oximeter on something that has a grey color? We recently had a dog with labored breathing, grey mm that had a pulse ox reading of 97%. Just curious on your thoughts there. It’s typically due to poor perfusion – their hemoglobin can still carry oxygen, but they may be shocky and poorly perfused.